Yup, you guessed it. As if I didn’t have enough fibre interests, I acquired a little Ashford Sample-It! Loom from the Once A Sheep stall at the Edinburgh Yarn Festival. Weaving had intrigued me for a while, but the relative expense of a knitters loom (near the £200 mark) was rather off putting. It just seemed awfully risky to lay out that sort of investment when I wasn’t sure if I would even like weaving. So the Sample-It! Loom worked out rather nicely. It is small, only producing cloth 8 inches wide. But for a beginner it is perfect. And if I want to make something bigger, I cannot see an issue with a few seams. Thankfully I have a sewing machine so I don’t have to inflict my hand stitching on anything! Of course…. 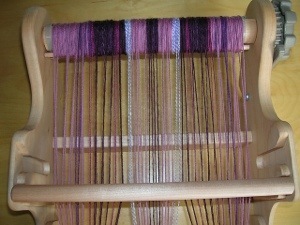 Having got the loom the warping proved to be fairly entertaining. 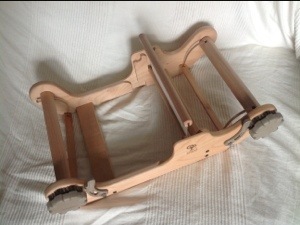 With practice I can now do it by myself, though for the first few times I had a obtain an assistant (thanks Mum!). A basic mini scarf seemed like the best introduction, so I raided the stash for some suitable yarn. And a bit later produced this. There are errors, as I tended to miss some of the warp threads if I didn’t concentrate. Although I subsequently determined that the tension in the warp was off, as a readjustment with later attempts has dramatically reduced this issue. Once I got the basic scarf down, I suddenly realised that I hadn’t checked Ravelry to see if there were any rigid heddle groups. There are. And one of the groups has a ongoing thread acting as a study group for the The Weaver’s Idea Book. After having a good nose around the thread (by which I mean looking at all the pictures), I figured this was not a bad investment. And I can recommend it. Nice, clear and straightforward, with a good range of patterns and techniques. The chapters are divided into various categories, #1 is plain weaving, #2 cover lace, etc. I started at the beginning (it seemed sensible). So first up was plain weave, with the caveat that plain weave does not need to be plain. One of the suggestions was using handspan to add additional texture and interest. This seemed like an excellent suggestion to me. So I grabbed the SpinPretty Angora / Merino blend I had also purchased in Edinburgh, and got a couple of hundred yards of slightly uneven (deliberately so) 2-ply. For the warp I used some Drops Alpaca in a pale Gray. The finished article turned out a couple of meters long, which was a bit of a surprise – I hadn’t expected the yarn to go so far. A good soak and the Angora fluffed up, while still keeping the woven texture clearly visible. So far so good. The next technique from the plain weave chapter was plaid – using different warps and wefts to create a pattern with the fabric. I think I can safely say I went a bit mad with this one, dragging any random purple skeins and remnants from my stash and mixing them all up. Some worked better than others, but overall I’m pretty pleased so far. I still have some yarns left and need to re-warp the loom and finish those off. After plaid comes the colour-and-weave techniques. Which could prove interesting. Tags: alpaca, handspan, loom, plaid, weaving | Permalink. To be honest with the move and everything, there hasn’t been a vast amount of knitting. Not really a surprise. The fact that I kept packing things also complicated matters. It does tend to put a spanner in the works when you think to yourself, ‘oh I’ll do that now’ only to find that everything you need to do said thing is not only packed but distributed across twenty seemingly identical boxes. At that point it is easier just to give up and go pack something else. You’d be amazed how many times this happened, and not just with knitting stuff. Two more ‘Flightless’ – this pattern is now available for sale! Details here, and available on Ravelry and Craftsy. 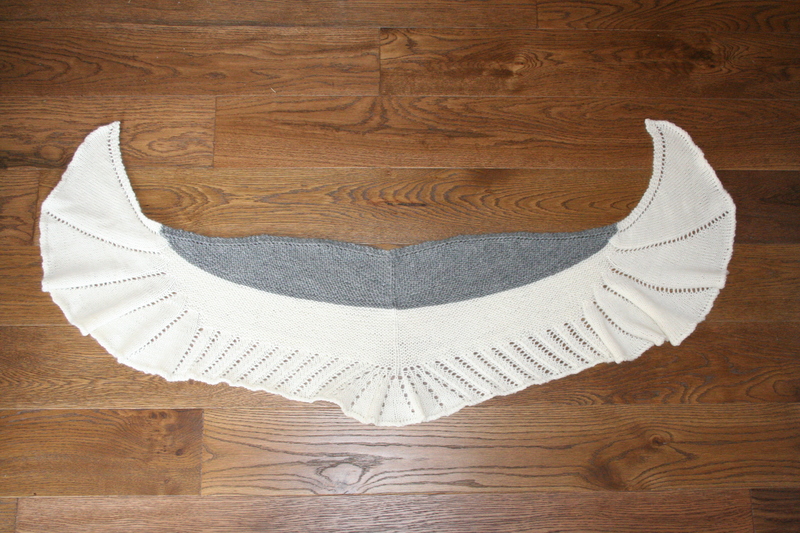 I also have another pattern up for sale, the Laitis Cowl. Again available via Ravelry and Craftsy, more details here. I also managed a couple of slightly different FOs. A couple of woven scarves. I won’t go into too many details now, but needless to say, I seem to have acquired a loom. 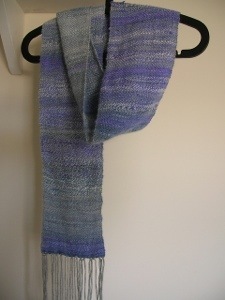 Tags: design, handspun, knitting, sample-it, shawl, spinning, weaving, wheel | Permalink. 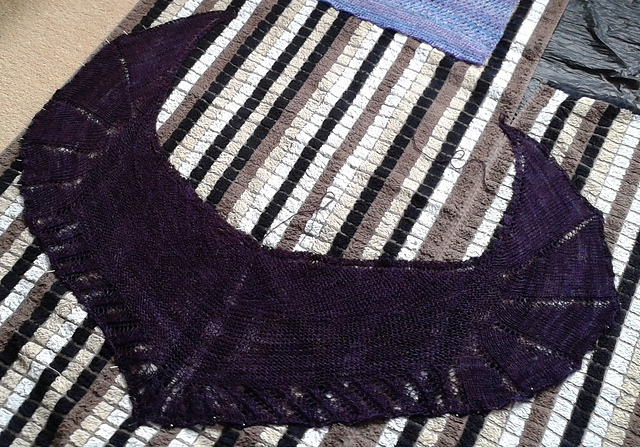 Since I last (ahem) blogged about my spinning, I have – unsurprisingly – spun a fair bit more. The last spinning post, detailing the first month of the handblended club from HilltopCloud, was some time ago. 200g Baby Camel and Tussah Silk blend in ‘Teal’. 100g Teeswater in ‘Winter Sunrise’, from the Best of British (BOB) Club, plied with silver thread. 100g Merino and Angora Blend in ‘Shades of Gray’. 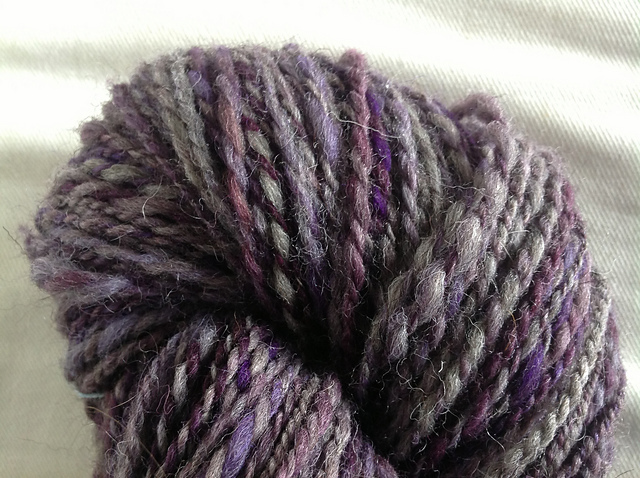 200g Merino and Silk Blend in ‘Purple’ and ‘White’. Blended during spinning to create a gradient yarn. Tags: angora, baby-camel, fibre, handspun, HilltopCloud, kiwi, Merino, shetland, silk, teeswater, tussah-silk | Permalink.